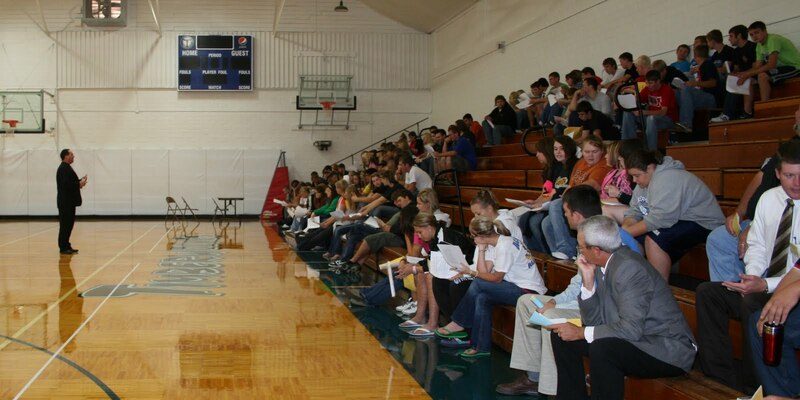 Fillmore Central and Exeter-Milligan juniors and seniors gathered in the Exeter-Milligan gym Wednesday morning at the start of the Careers in Fillmore County Day. 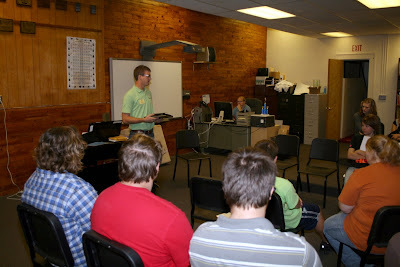 Kenton Moore, a 2005 Exeter-Milligan graduate who has chosen to return to Fillmore County to work explained to Fillmore Central and Exeter-Milligan students the opportunities in the construction field in the county at the Careers in Fillmore County Day. Exeter-Milligan and Fillmore Central High School students were given an opportunity on Wednesday morning to explore their possible employment future in Fillmore County. The annual Careers in Fillmore County Day was held in Exeter with presentations by many Fillmore County employers. Students could choose three presentations from six areas to attend. The areas were Construction and Drilling, Ethanol, Implement Dealership and Crop Consulting, Investments, Finance and Insurance, Medical and Nursing, Computers, Cosmetology and Corrections and Car Dealership, Manufacturing and Trucking. The Fillmore County Development Corporation (FCDC) sponsors the event, calling on the businesses in the county to meet with the students and share about opportunities in the county. The business members are paired with Fillmore County Development Corporation Board Members who introduce the business representatives and help answer questions. FCDC Director Patt Lentfer coordinates the project and states that the "goal of the project is to let students know that there are job opportunities in Fillmore County and encourage them to come back." An estimated 127 students attended the event. This career day is unlike the usual career day in that it "highlights opportunities that are available in their own community," said Lentfer. During the session on Investments, Finance and Insurance, First National Bank in Exeter President Alan Emshoff encouraged the students to "Open your minds to jobs and opportunities in Fillmore County. You probably aren't thinking about coming back to Fillmore County but there is always a place for you here." This year two Exeter-Milligan graduates came back to the event as representatives of local businesses. Kenton Moore, a 2005 Exeter-Milligan graduate, spoke on behalf of Horizontal Boring and Tunneling, Inc. and Wade Sluka, a 2007 Exeter-Milligan graduate, represented Geneva Implement. After attending their chosen three sessions the students were served lunch courtesy of the FCDC by the Exeter-Milligan FCCLA.